Many of the most expensive pieces of art have been sold behind closed doors -- making precise figures hard to come by -- but even the lowest estimates are eye-watering. 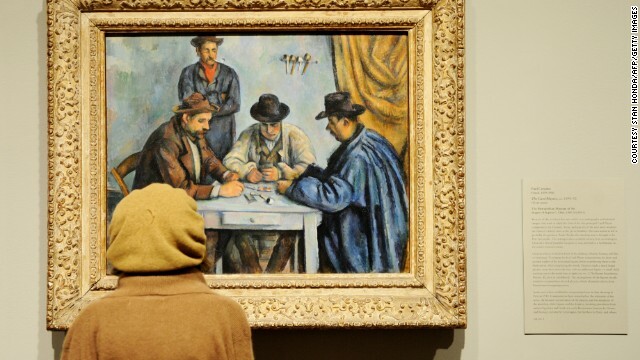 The Card Players, painted by Paul Cézanne in 1892/3, was reportedly sold to the State of Qatar in April 2011 for between $250 - $300 million. Woman III is a painting by Dutch abstract expressionist artist Willem de Kooning . 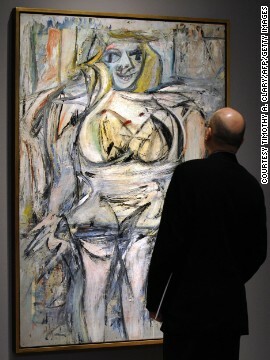 The New York Times reported that the painting sold for $137.5 million in November 2006 to billionaire Steven A. Cohen. American hedge fund manager Steven A. Cohen also snapped up this 1932 Picasso painting Le Reve in March 2013 at a private sale. 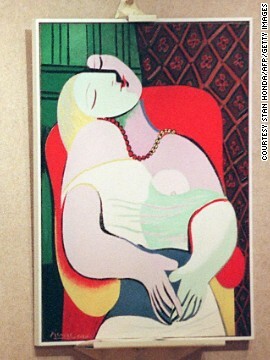 The piece, which he bought for an estimated $155 million, portrays Picasso's 22-year-old mistress Marie-Thérèse Walter. 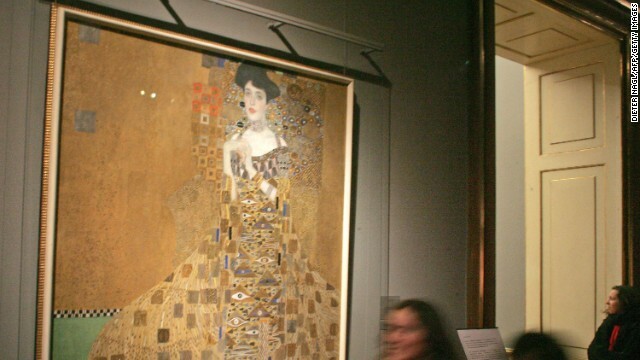 This 1907 Gustav Klimt painting Portrait of Adele Bloch-Bauer I sold for $135 million -- the highest sum ever paid for a painting at the time -- in June 2006 to billionaire Ronald Lauder, according to the New York Times. Adele was the wife of Ferdinand Bloch-Bauer; a wealthy industrialist who sponsored the arts and supported Gustav Klimt. 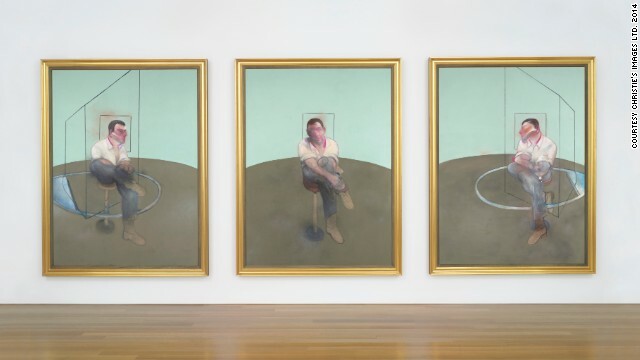 The oil-on-canvas triptych Three Studies of Lucian Freud painted by Francis Bacon in 1969, sold at auction for $142.4 million in November 2013. The buyer was Elaine Wynn, ex-wife of American business magnate Steve Wynn. Expressionist artist Edvard Munch created a series of paintings and pastels between 1893 and 1910 which he named Der Schrei der Natur (The Scream of Nature). Now popularly known as "The Scream," the works show a figure with an agonized expression against a landscape with a tumultuous orange sky. 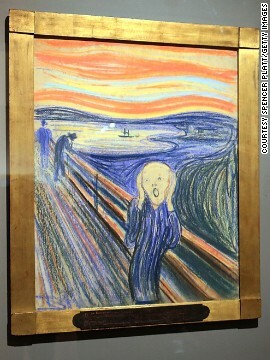 This piece, painted by Munch in 1895, was sold in May 2012 for $119.9 million at Sotheby's, New York. Bal du moulin de la Galette is an 1876 painting by French artist Pierre-Auguste Renoir. 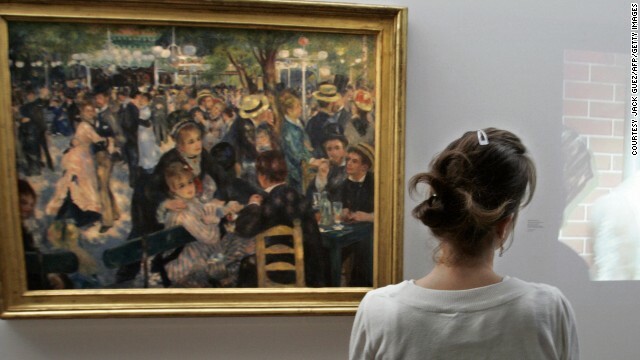 It is often cited as one of Impressionism's most celebrated masterpieces and depicts a typical Sunday afternoon at Moulin de la Galette, in the district of Montmartre in Paris. The piece sold for $78.1 million in 1990 to honorary chairman of Daishowa Paper Manufacturing, Ryoei Saito at Sotheby's, New York. 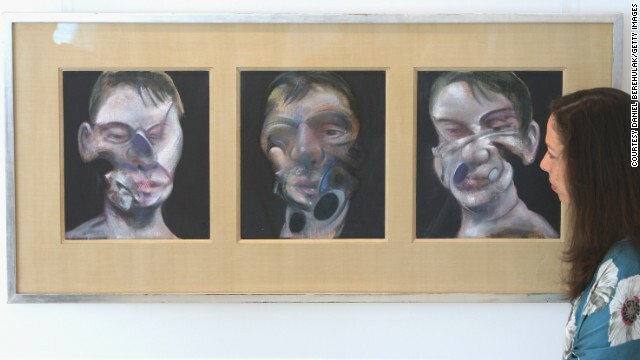 Painted in 1984, this Francis Bacon triptych Three Studies for a Portrait of John Edwards is one of the most anticipated pieces up for auction at Christie's on May 13. 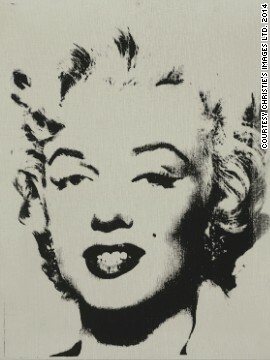 It will be sold for an estimated $80 million according to Christie's. This Andy Warhol painting of Marylin Monroe is up for auction at the Post-War and Contemporary Evening sale at Christie's New York. It's called White Marilyn and was painted in 1962. The signed painting will sell for an estimated $12 - $18 million at the auction on May 13. This painting of ex-Beatle John Lennon is up for auction with a price tag of $2,500,000-$3,500,000 at the Post-War and Contemporary Evening sale at Christie's New York. 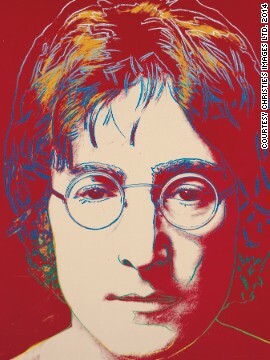 John Lennon was painted between 1985/6 and is marked with the Estate of Andy Warhol stamp. (CNN) -- When Christie's launches the latest auction at its New York showroom this evening, gavels will fall. Prices, however, will almost certainly rise ... and rise. For its Post-war Masters and Contemporary Evening Sale, one of this year's headline art auctions, Christie's has on offer masterpieces including Francis Bacon's Three Studies for a Portrait of John Edwards, Gerhard Richter's Abstraktes Bild (712), and Mark Rothko's Untitled during a night expected to fetch well north of $200 million. Christie's estimates that the Richter work will command a price of between $22 and $28 million, the Rothko between $40 and $60 million, and the Bacon triptych around $80 million. The house has reason to be upbeat with its estimates. On May 12, during an auction titled "If I Live I'll See You Tuesday," buyers from 26 countries splashed out on contemporary works by artists including Jean-Michel Basquiat, Jeff Koons and Richard Prince. Christie's sold $134.6 million of art in an hour. Speaking to journalists after the show, Christie's Chief Executive Officer Steven Murphy suggested that buyers from emerging markets are helping keep the market vibrant. "The number of people around the world interested in acquiring art at all levels is exploding," he said. "We are not in a bubble." Viola Raikhel-Bolot, the director of global art advisory firm 1858 Ltd Art Advisory, believes international buyers will turn out en masse for tonight's auction. "The place to buy post-war and contemporary art seems to remain New York," she says. "Collectors from Latin America and Asia frequent the galleries here and follow these sales very closely." Read "The dark side of creativity: Depression + anxiety x madness = genius?" In recent years sales of fine art have trended in one direction: up. 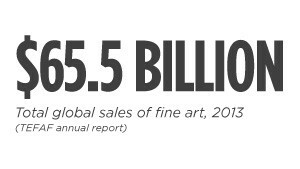 According to the annual report of the European Fine Art Fair, global sales of fine art and antiques jumped 7.5% in 2013 to $65.5 billion, just under the all-time high set in 2007. This includes auction sales and estimates of anonymous sales. 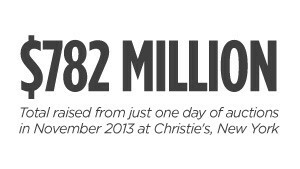 In 2013, Christie's tallied more than $7 billion in sales, breaking its own record for the fourth consecutive year. In November 2013, a Christie's auction in New York brought in $782,368,375, the highest auction series in art market history. 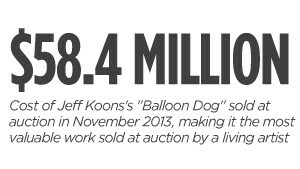 Jeff Koons's Balloon Dog sold for $58.4 million, making it the most valuable work sold at auction by a living artist and at the same auction, Francis Bacon's triptych of Lucian Feud, sold for $142 million. Andrew Renton, director of London's Marlborough Contemporary gallery and a professor of curating at Goldsmiths College at the University of London, points out that there are many more deals going on in private, and that some likely outstrip existing records. "We've got an economic model which is slightly contradictory," Renton says. "Prices seem to set the value. Overpaying is almost the best thing you can do, because you start to define your own market." But this isn't a free-for-all. He believes buyers with deep pockets want superlative works that delve into our psyche. "Bacon works on that model," he says. "He gets into the soul of the anxious human being. And in Rothko the abstraction is a reflection of the darkness and the contemporary condition. "People talk about these things in monetary terms. You don't get to that monetary value unless there is a correlation with cultural value." As classic works become more scarce, their value will continue to rise -- as will the hoopla surrounding them. "I do not believe there is a price ceiling," Renton says. "In our lifetime we will see a billion dollar work of art."